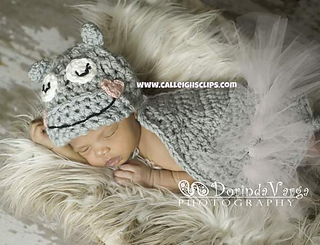 Introducing my new line of Photography Props - Cuddle Critter Cape sets are for use in Newborn photography. Great for photographers to have on hand for sessions. 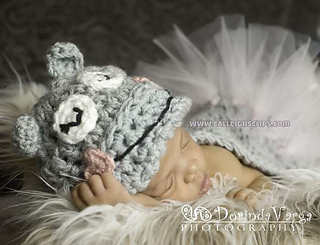 Designed to make it simple if a baby is sleeping on their tummy just slide on the hat and you now have a cute little baby dressed up like your favorite critter. 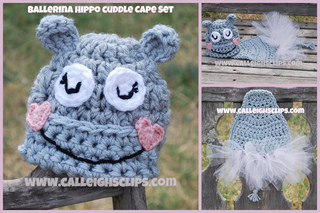 *This Set is for Halleigh and Hayden the Hippo. Features a boy and girl look and directions with images on how to attach the tutu to the cape. These are sets because they are two pieces. You can use just the hat, just the cape or button on the cape for a a one piece. I used: Vanna’s choice - Worsted Weight (4) 1 - Skein Silver Heather, & small amount of White, Black and a contrasting color of choice. Note: For the entire pattern you will be working with two strands at the same time to make them bulky unless otherwise noted. You may want two skeins of the color used unless you can work with a strand from the outside and middle of one skein. Due to the nature of patterns, this pattern may not be returned or exchanged. All sales are final. If you have questions or concerns I will do my best to help you via email. You will need Adobe to read this pattern; it can be downloaded at no cost online (www.adobe.com). Please do not copy and/or redistribute this pattern. You are welcome make and sell items made from this pattern if you desire. I just ask that proper credit for the pattern is given by linking back to me. Please don’t use images for any use! Thanks!